What is ODS in Palestine Ltd? 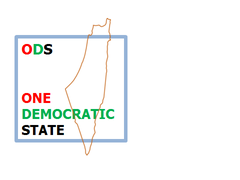 ODS means One Democratic State. Palestine means today's Gaza, West Bank and Israel; in other words, historic Palestine or the territory of the League of Nations' British Mandate Palestine. The citizens of this state would be all present citizens of Israel plus residents of the West Bank and Gaza plus all Palestinian refugees and their descendants. 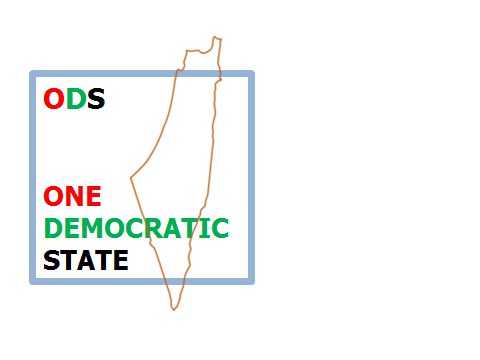 ODS in Palestine (England) Ltd (or simply 'ODS England') is a non-profit organisation that aims to educate and organise, both in historic Palestine and in England, for One Democratic State. It is a Company Limited by Guarantee, Number 08615817. - developing strategies for its achievement. Our foundational document is the Munich Declaration. It is part and parcel of the Articles of our Company, 'ODS in Palestine (England) Ltd'. The Declaration was adopted unanimously at a meeting of international ODS activists in Munich on 2 July, 2012, and is likewise the foundational document of organised ODS groups in Texas, the West Bank and Yaffa/Tel Aviv. It is a short version of several previous declarations passed at conferences in Stuttgart and Texas and discussed in Haifa, London and Boston. It thus builds on the work of the participants in those conferences. Adherence to the Munich Declaration is sufficient for participation in and identification with the ODS movement. Our Awda Key (Key of Return), pictured in a few places on this site, has been on exhibit in front of St Mary's Cathedral (the Anglican one) in Edinburgh since summer 2017, first as part of the fringe of the Fringe of the Edinburgh Festival. It seems likely that it will remain there for some time, thanks to Colin Cooper and his friends in Scotland. We hope it has triggered discussion of the right of the millions of displaced and dispossessed and exiled Palestinians to return to where they came from inside today's Israel. In December 2017 we supported the second General Assembly, held in Istanbul, of the international Popular Movement for ODS on the Land of Historic Palestine. This group was founded in May 2013 and since mid-2016 is a Swiss Association registered at Handelsregisteramt Zürich, Company Number CHE-390.290.948. Most of its members reside in the West Bank and Gaza. Four members of its Board are also members of ODS England who attended its first General Assembly, also in Istanbul, in mid-January 2017. For fall 2017 we had planned a 5-hour seminar in London to try to flesh out some of the details of ODS and discuss contested issues concerning Right of Return, the nature of ODS's offer of citizenship to all present Israelis, and the tension between the liberal-democratic, individualistic ODS discourse and that of Palestinian nationalism/self-determination. This had to be postponed but is still a priority. For previous events see our Events page.